Another beautiful day without a cloud in the sky. “A perfect day for waterfalls” Aunty said after the rain earlier in the week. I was dispatched early to the kitchen to make the tea and sandwiches for the expedition. Preparation and an early start were important. We needed to be back for the match at 3pm this afternoon – though Aunty was a little disappointed by this news. We started at the top of the Afon Mellte, which could be translated as the Lightning River, probably a reflection of how quickly the water rises in the river after rain. Parking in the car park near Porth yr Ogof I duly paid my £4 parking fee and we set off down the steep path to the river to see the entrance to the cave system. Porth yr Ogof is the largest cave entrance in Wales and one of the largest anywhere in the United Kingdom. It is nearly 20 m wide and some 3 m high. Aunty is dwarfed by the size of the cave entrance. 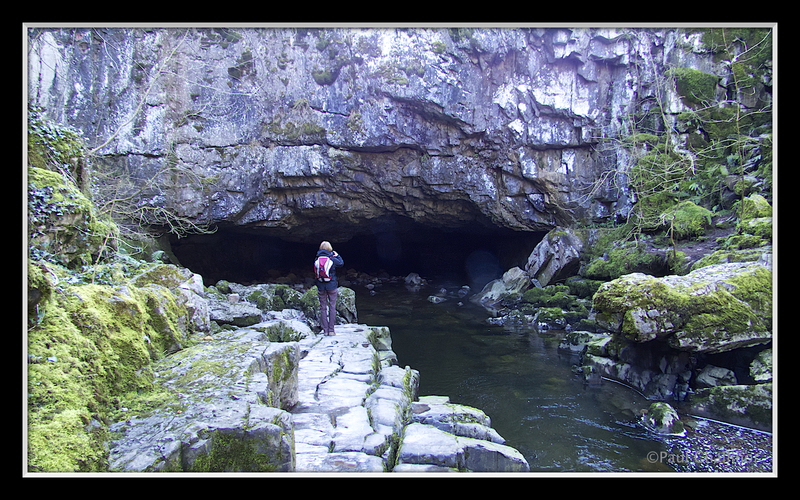 The Afon Mellte disappearing into the entrance to Porth Yr Ogof. 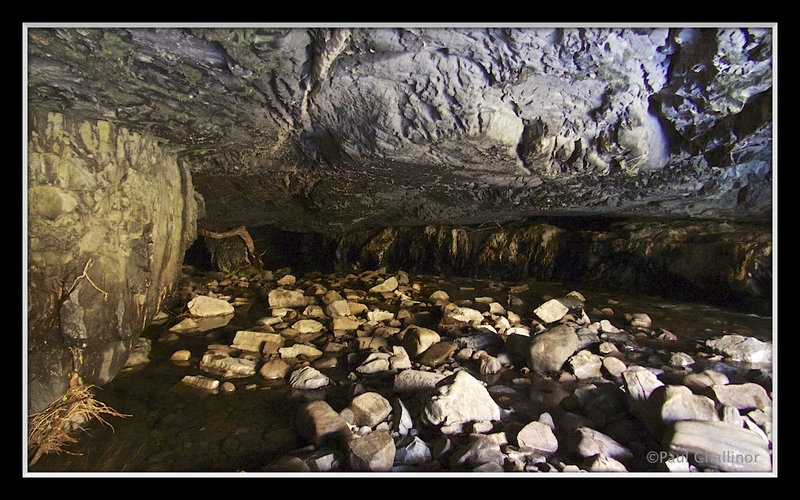 The cave system has been used by cavers for some years, but it has a reputation as a dangerous system with unfortunately 11 deaths since 1957 due to drowning. 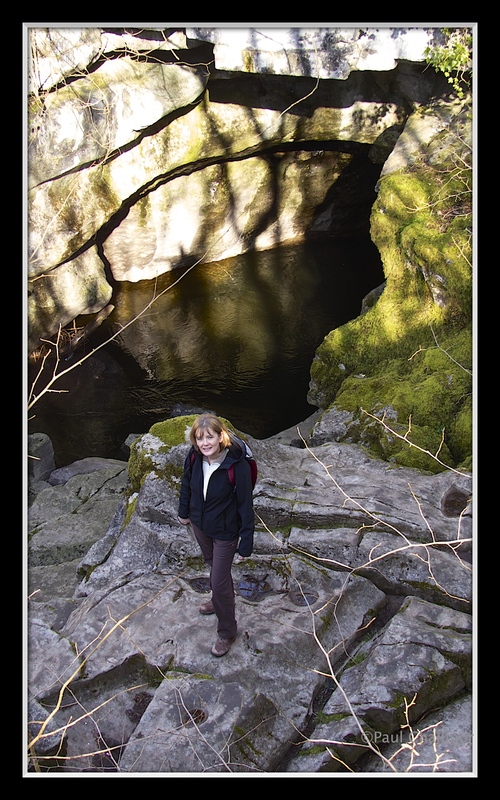 We then climbed back up the bank and walked along the path for about 250 yards to see where the river emerges down stream. It is apparently at this point that is the greatest danger to the cavers. We were hoping to see 4 water falls today, but the path down to two of them was closed, so the Four Falls Trail was turned into the Two Falls Trail. The walk along the bank of the river was fantastic. Spring is now in full swing with the chaffinches shouting from the tree tops, and robins squaring up to each other all along the walk. We also saw grey wagtails, dippers and heard a green woodpecker cackling in the woods. 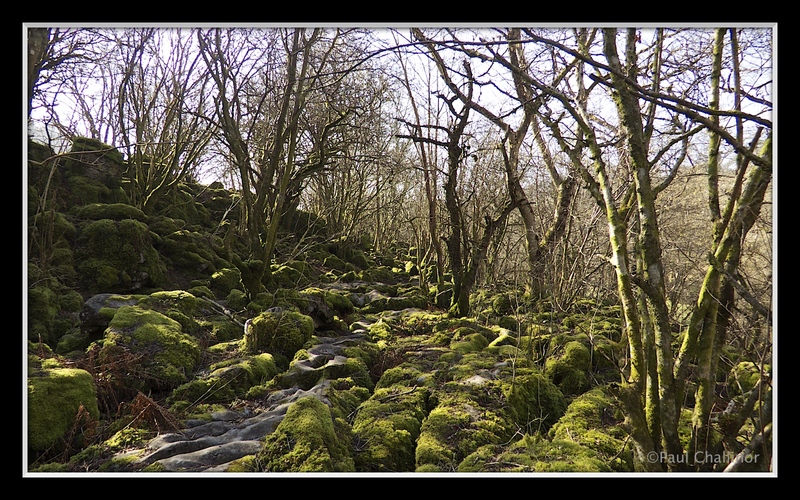 The limestone pavements in areas of the forest as carpeted with moss. 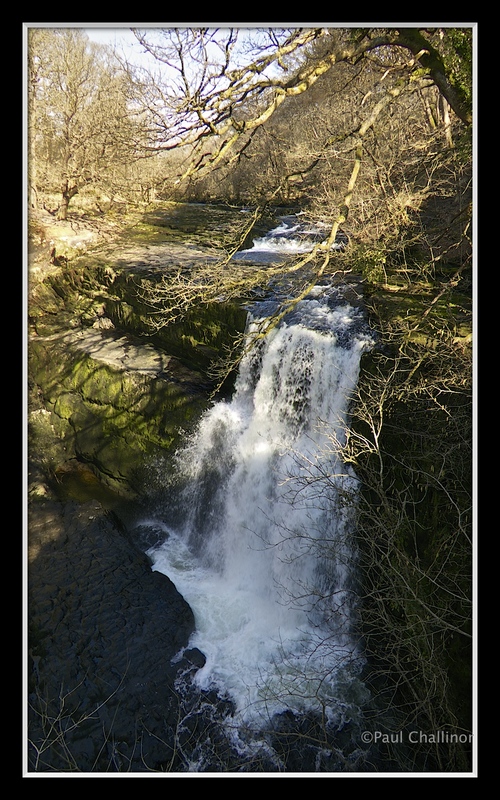 The first waterfall we found was Sgwd Clun-Gwyn, White Meadow Waterfall. In fact we heard it well before we saw it. The water was thundering over the rocks. The full drop is over 40 feet, and the white sheet of water falls over two shelves. After a refreshing cup of coffee we set off to Sgwd Yr Eira. This is perhaps the most famous of the many waterfalls in the area. 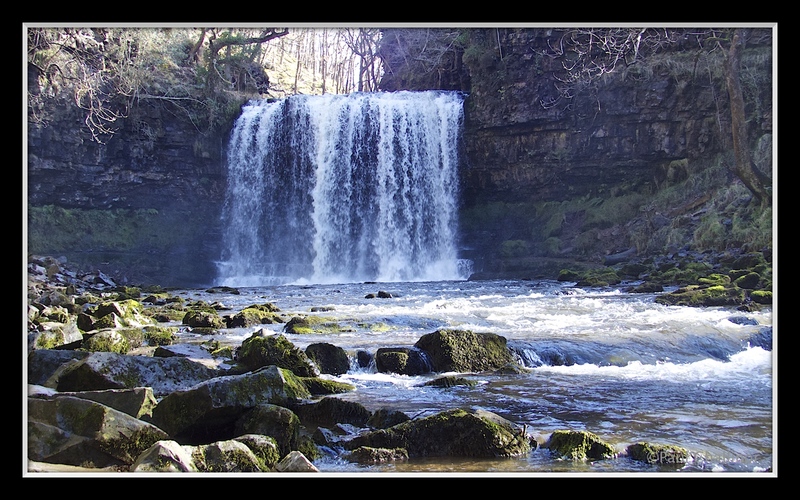 Sgwd Yr Eira, Waterfall of Snow in English, is a broad crashing waterfall as the Afon Hepste hurtles over the harder gritstone through the limestone and sandstone rocks in the Cwm. It is possible to walk behind the falls, but today there was too much water, and we would have got very wet doing so. The water was pounding down onto the narrow ledge that leads you through behind the curtain of water. 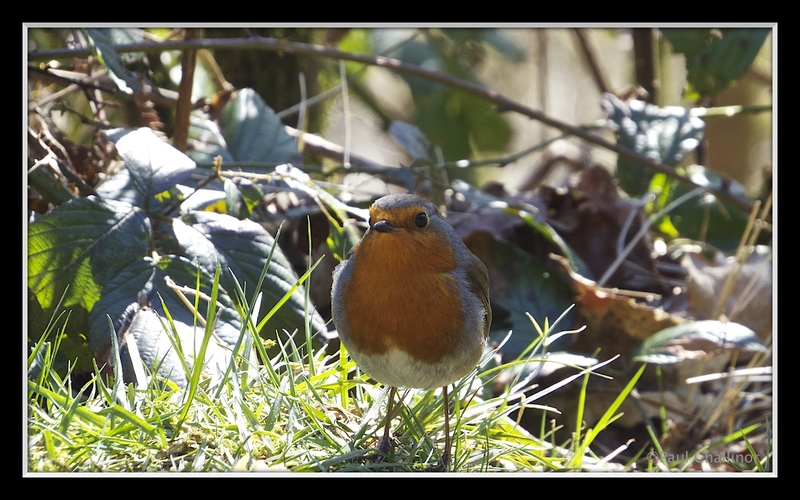 As we sat down to another cup of coffee, and a lunch of perfectly crafted ham and cucumber sandwiches we were joined by a robin hoping for a free lunch. I also saw a common lizard scurry across the path next to me, but he was too quick and didn’t wait around for a photo call. After lunch it was back to the car through the forest, feeling a little disappointed we were not able to see the other two falls. Next time!